Happy Holidays from the ITM! 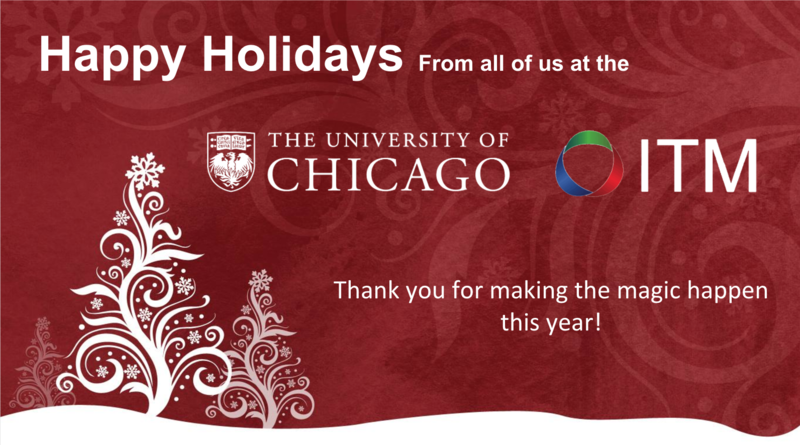 All of us at the ITM wish you a happy and healthy holiday season! With this year of great growth and success behind us, we look forward to many more good things to come in 2017. From the new ITM space and remodeled Clinical Research Center (CRC) to new ITM Pilot Awards, improved support services, new events, and more, 2017 has much in store for the ITM. Thank you for helping make this all possible, and cheers to everything the new year will bring! Stay connected with us through our newsletter, Facebook, and Twitter to be the first to know about the new ways the ITM can help you in 2017. Sign up for our newsletters below.